Last night, I was among the crowd who filled a large lecture theatre at the Australian National University in Canberra to hear a presentation by Dr Sayyed Mohammad Khatami, Iran's President from 1997 to 2005. Dr Khatami spoke confidently about dialogue among civilisations starting at a grassroots level between civil societies of various nations. Khatami argued limiting dialogue to politicians could result in just another round of negotiations that entrenches the geo-political status quo. I've criticised the views of some who object to the involvement of a Victorian university and the Anglican Church in hosting Dr Khatami. Yet the fact that these critics frequently don't acknowledge crimes committed by one non-Arab state in the Middle East doesn't mean their critique of the other non-Arab state in the Middle East is without foundation. Iran isn't a haven of liberty and human rights. There's plenty of evidence from credible sources about the mistreatment of ethnic, sectarian and religious minorities (not to mention bloggers and student activists) in Iran, including during Khatami's rule. I don't know what it's like to live in a country where I could be jailed or denied access to a tertiary education for my religious beliefs. Yes, here I have to put up with reading racist and xenophobic material published in tabloids. Some schools may not want my type teaching their kids. But I'd sooner be a South Asian Muslim in Australia than a Bahá'í in Iran. Hence, I refused to stand with those who stood for Khatami. No amount of sweet talk about dialogue between civilisations was going to convince me to get out of my seat. I wanted to hear what Khatami had to say about minority rights. Khatami received two questions about the treatment of Bahá'ís, including one about a law that disallowed Bahá'ís from attending public universities. Khatami was much more blunt than I'd expect of a politician from a dictatorial regime. He admitted people were imprisoned in Iran because of their religious beliefs, including Bahá'ís and even Muslims from the dominant Shia sect (who presumably opposed Ahmedinejad). He said this happened for any number of reasons, none of which were justifiable. 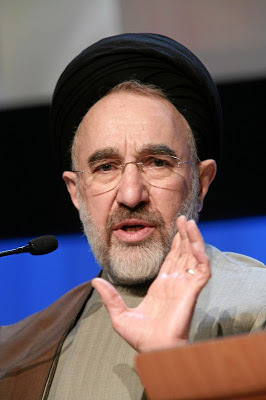 Khatami also acknowledged women were mistreated, and blamed his colleagues from the religious establishment for interpreting texts in a discriminatory manner. Yet progress had been made, especially in tertiary education where over 70% of students were female. Khatami said all this in a public lecture in the presence of Iranian diplomats, who would certainly report his comments back to officials in Tehran. If everything we're told about Iran being a police state is true, Khatami was a brave man for criticising his own country so brazenly. Of course, none of this will please the neo-Con ayatollahs of free market fundamentalism. But with most Iranians under 30 and from a generation that only knows a repressive revolution, it's little wonder young Iranians embraced Khatami's politics and continue to do so. We may not like Khatami, but he polled 70% of votes cast in the 1997 Iranian election, and then 77% of votes cast in the 2001 election. That's enough reason for dialogue.